Founded in October 1996, Windwhistle Company of Archers seeks to foster and promote traditional archery in its many forms. The club is a non-profitmaking organisation run by volunteers. 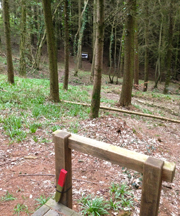 Our field-archery course is set in 28 acres of private woodland located between Crewkerne and Chard. It covers easy to medium terrain and is designed to challenge both novice and experienced shooters. In addition, the club has occasional use of fields near the village of Roundham, for roving marks and clout shoots. In the winter months we also get together regularly for informal indoor target-archery competitions. 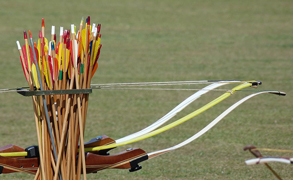 As traditional archers we allow English longbows, American flatbows, primitive bows, recurves and old styles such as Mongolian or Korean bows. 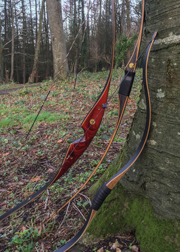 We now permit recurve bows with metal risers as well as wooden ones. However, all arrows shot at Windwhistle must be wooden with feather fletchings. If you’re new to archery, we recommend getting some advice and practice before you buy your first bow. The club can usually lend beginners suitable equipment during their training period and for a short while afterwards. A PDF of the club’s rules is available from our Membership & Tuition page. During the summer we offer “have a go” sessions at various local events. So if you haven’t tried archery yet or would like to rediscover it, why not come along and find us on our stall? Visit us on Facebook or see our News & Events page for details of any upcoming events.